Headquartered in Mumbai this private sector bank is leading bank in market capitalization. Being ranked 69th in 100 leading brands it is a big market name itself. Admired for its number of services it has become first choice of number of customers. HDFC focus on offering its customers with easy and fast transactions with number of benefits. In today’s online world when everyone believes in comfortable and reliable shopping, no one gets time to rush to ATM’s when you are running out of cash. Credit cards make life easier you can make all your payments on these online stores by just filling your details. HDFC being a big name and connected to number of customers is associated with number of online stores. These online stores benefit all customers with number of discounts and coupons who make their payments through HDFC credit card. HDFC offers its customers with variety of credit cards such as Diners Club Black, Titanium Times Card, Jet Privilege HDFC Bank World and the Platinum Times Card and each card brings different benefit. Online stores like PayZapp, Flipkart, Amazon, Makemytrip, Goibibo and others brings you with number of benefits while using HDFC credit cards. Not only you enjoy savings on your shopping but you get reasonable rates on your travel expenses, flight bookings, hotel, movie tickets and many more. Get flat 30% off on all hotels at Republic Day. Maximum discount that can be availed is Rs.40,000 per booking. Grab the coupon code to redeem this offer. Offer is applicable to all the eligible HDFC's Credit Card holders. Offer is valid till 31-1-2018. Visit the store and get additional 10% cashback on spends using valid HDFC Bank Debit and Credit Cards. Offer is valid on minimum transaction of Rs.1499. You may get maximum cashback of Rs.300 per card per month. Offer cannot be combined with any other offer. Enjoy 30% discount on Grofers orders, when payment is made through HDFC Debit Card, HDFC Credit Card or online banking or net Banking. Apply the coupon or promo code at the time of payment and save money. This Coupon code is valid in some selected cities only like, Ahmadabad, Bangalore, Chennai, Hyderabad, Jaipur, Kanpur, Kolkata, Lucknow, Mumbai, NCR, Pune, Surat, and Vadodara. The amount of discount may vary from order to order. Enjoy the offer before it ends and save money. Next time while booking flights or hotels from Cleartrip use your HDFC Bank Credit Card and get a cashback up to Rs.10,000. Offer is valid only on Saturday and Sunday. Use the promo code at the time of booking. Promo code used after booking will not be considered. Book for Rs.500 or more with your HDFC Bank Netbanking, Credit/Debit Card and get a cashback of up to 10%. Offer is applicable on All Private and APSRTC Bookings. Use the coupon code to avail this offer. Get up to 15% discount when payment is made through HDFC Cards. This offer is available for HDFC users only. Ferns N Petals has the authority to withdraw or extend the given offers without any prior information or notice. Get the offer and save money. Get other exciting offers also. Shop online AC and 5% instant discount when you pay by HDFC Debit or Credit Card. Minimum purchase of Rs.25,000 can be availed. Free standard installation, free 2 years extended warranty, and free annual maintenance are also available. Check out the promo page for more details. Snapdeal is giving special offer to HDFC Bank users. Avail a flat 5% instant discount on online purchases. Earn 2 Reward points per Rs.150 on other spends. Please visit the offer page for more details. This's movie time. Save 25% on movie tickets when you pay via HDFC Time Card. Offer is valid for Cinépolis movie tickets booked only on all days of the week. Maximum discount of Rs.200 to be offer per transaction. Discount will be given only one time per card per month for each Qualified Customer during the offer Period. Shop on Jabong and get 10% cashback when you transact minimum Rs.2,499. You can earn maximum cashback of Rs.500. Offer is valid on transaction made using HDFC Bank Credit Card & Debit Card. Offer is applicable to both Jabong App and Website. Offer is valid on Every Monday during the offer period. Get an exclusive fare promotion for selected HDFC Bank Debit & Credit Cardholders. Enjoy Priority 24 Hours early access to our promo fares when paying with selected HDFC Bank debit & credit cards. Offer is valid for new purchases only. Shop now and get 5% discount on online order when you pay with HDFC Bank Credit or Debit Card. Also get 2 reward points on every Rs.150 spends. Check out the promo page for more details. Goibibo is giving a cashback of Rs.555 on every domestic flight & hotel booking done using HDFC credit card. Minimum booking amount to avail the cashback is Rs.3000. You have to apply the given coupon code at the time of booking. Customer will not be eligible for cashback if there will be cancellation of the booking. Shop online now and get up to 60% off across the site for HDFC Credit Card Holders. Apply the given promo code before it expires. Check out the promo page for more details. Put food order online now to enjoy Rs.75 off when payment is made through HDFC Debit Card, HDFC Credit Card or online banking. Apply coupon or promo code at the time of payment and save money. The amount of discount may vary from order to order. Enjoy the offer before it ends and save money. Shop on Jabong using HDFC Bank Credit Card & Debit Card and get 10% cashback on minimum transaction of Rs.2499. You may earn maximum cashback of Rs.500. Offer valid only on transactions made using HDFC Bank Credit Card & Debit Card. Offer is applicable on both app and website. Book an OYO room and 10% cashback when you pay via HDFC Cards. The maximum cashback amount is Rs.300. No minimum transaction amount is required. Offer is valid only once per user. Select the domestic hotel of your choice and get Rs.555 cashback when you spend minimum Rs.3000 or more. Coupon code is also available. Offer is applicable on Friday, Saturday, and Sunday. Cashback will be processed within 75 working days from the date of booking. Buy Samsung S9 (Polaris Blue) at Rs.57, 900 only. Colors available are: - Black, Blue, Purple, Red, Sunrise Gold and Polaris Blue. Phone Features: - 64GB Storage, Low light photos, Stereo Speakers, 2.7GHz, 1.7GHz CPU Speed, 189g Weight, 3500 Standard Battery Capacity, 12.0 MP rear Camera and so on. Get 4,000 cashback on HDFC Credit Cards. Checkout full details on the offer page. Affordable shipping to make you say. Get 10% instant discount when you pay with HDFC Credit & Debit Card. No coupon code is required to avail this offer. Check out the promo page for more information. Enjoy 5% cashback on all purchases above Rs.1500 on online food delivery. Maximum cashback per customer per month is Rs.250. No need to apply the promo code at final payment. Offer is valid using HDFC Bank Debit Cards. Cashback will be posted within 90 Days of the closure of calendar month of transaction. Buy and get flat 30% off on personalized products. Grab the coupon code to redeem this offer. Offer is valid entire payment through HDFC Rupay Debit Card only. Hurry to avail this offer before it ends. Shop now online and enjoy 30% discount when payment is made through HDFC Debit Card, HDFC Credit Card or online baking. Apply coupon or promo code at the time of payment and save money. The amount of discount may vary from order to order. Enjoy the offer before it ends and save money. Enjoy an extra 10% off on your hotel booking at Expedia. Offer applicable only if you make the payment through HDFC Bank Credit Card. Apply the coupon code at checkout to avail this offer. Now avail flat 20% discount when you pay with HDFC Credit or Debit Cards. Offer is applicable on orders above Rs.5,000. Use the given coupon code at final payment. Offer is applicable for daily, weekly, monthly packages. Samsung gives you HDFC bank cashback offer. Use HDFC Credit Cards and get cashback of Rs.6000. Offer is valid for purchase at select participating stores. Offer is valid till 30-4-2018. Enjoy a discount of Rs.400 when you book your 6E Flight. Enter the given promo code while making the booking. Offer is applicable for new bookings with HDFC Credit and Debit cards. Offer is valid on every Friday during the offer period. The Offer is valid for transactions in Indian Rupees only. Buy now and get 10% instant discount on a minimum spend Rs.3000. No coupon code is required to avail this offer. Offer is valid on HDFC Credit and Debit Cards. Shop for Coolpad Smartphones online at Snapdeal and save the money. Deal starts from Rs. 7,749. No coupon code is required to avail this offer. Enjoy extra 10% instant discount using HDFC Bank Credit Cards. Check the deal page for more details. Get an exclusive offer for HDFC Bank Credit and Debit Card customer. Enjoy Rs.1000 cashback to card on purchase of MMT Double Black membership. Cashback will be credited within 60 days from the date of purchase of MMT Double Black membership. This offer is not valid on HDFC bank Corporate Cards. Now avail up to Rs.1,500 instant discount on domestic flights when payment is done via HDFC Credit or Debit card every Sunday. Coupon code is available to enjoy the deal. This offer is valid on payment made through HDFC Bank Debit & Credit Cards only. Put order of grocery items online now to enjoy Rs.100 off on order of Rs.1000 & above, when payment is made through HDFC Debit Card, HDFC Credit Card or online banking. Apply coupon or promo code at the time of payment and save money. Enjoy the offer before it ends and save money. Book now and get up to Rs.9000 cashback on International flights when you pay through HDFC Bank Credit Card. Grab the coupon code to redeem this offer. Offer is valid for booking on Thursday. Coupon code can be availed per booking per card. Shop on Jabong using HDFC Bank Credit Card and get 5x reward points on all your spends. You can earn maximum 5000 reward points per card in one month. Offer is valid on transactions made using HDFC Bank Credit Card. Now get extra 5% off when you pay through HDFC Debit and Credit Card. Coupon code is also available. Hurry to save the money. Book online and get 5% cashback on EMI transaction with HDFC Bank Credit Cards. To avail this offer, the user has to apply the given coupon code. The minimum transaction amount should be Rs.3,000. Customers can enjoy the benefit of this offer only twice in the offer period. Visit the store and get 20% off on bookings on all cars. Offer is valid on all cars, across all cities, and all days. Offer is applicable on payment done by HDFC Credit Card and Debit Card. Visit the store and get Rs.500 off on a minimum purchase of Rs.2000. Use the given voucher code at the time of checkout. Maximum discount is capped at Rs.500. Offer will be valid on payments made with HDFC Credit cards only. Offer is valid till 30th June 2018. Use your HDFC Bank Credit Card to make payment at Makemytrip and earn 5X reward points for your transaction. Offer valid on domestic flights, international flights, domestic hotels and international hotel bookings. Use coupon code at the time of booking. HDFC Bank Offer - Flat 25% OFF on Furniture Brands "Woodsworth"
Purchase online and get flat 25% off on furniture brand "Woodsworth". Use the given coupon code at final payment. Offer is valid for HDFC Debit or Credit Card users. This offer is valid only for genuine customers. Get instant discount of Rs.250 on your orders by paying through HDFC bank credit and debit cards. Use the given coupon codes to avail the offer. Offer is valid only for HDFC credit and debit cardholders. Offer is valid for every month of 1-7th. Put food order online now to enjoy Rs.75 off, when payment is made through HDFC Debit Card, HDFC Credit Card or online banking. Apply coupon or promo code at the time of payment and save money. Enjoy the offer before it ends and save money. Grab the best dels on flights with HDFC Bank Credit Cards. Save 10% discount on flight bookings. Use the voucher code to avail this offer. This offer is valid every Monday during the offer period. Offer is valid only for online confirmed bookings. Visit the store and enjoy 25% discount on the purchase of movie tickets with your HDFC Times Card. Offer is valid till 31-3-2018. Check out the promo page for more details. Book directly and enjoy zero convenience fee. Get a free meal and priority check-in on booking with HDFC Bank Credit Card. Grab the coupon code to redeem this offer. Offer is valid only on fresh booking made on the app during the sale period. Shop online now and get flat 30% off on furniture brand Woodworth. Use the given voucher code at final payment. Offer is applicable to HDFC Card Users. Offer is valid till 31-12-2017. Book your Spicemax seat using your HDFC Bank Credit Card and get up to 50% off only at Spicejet. Maximum discount available is Rs.500. Use the promo code at the time of booking. Shop now and get the End of Season Loot on your favorite mobiles. Enjoy 10% instant cashback on HDFC Bank Credit Cards. No need to apply the coupon code at final payment. Use HDFC Credit or Debit card and get a discount of 5% Discount. Offer includes various categories laptops, desktops, printers, ink & toner, monitor, and many more listed on the promo page. Offer is valid for HDFC users. Get up to 18% discount on order of minimum Rs. 999. This offer is available for HDFC users only. Ferns N Petals has the authority to withdraw or extend the given offers without any prior information or notice. Get the offer and save money. Get other exciting offers also. Purchase any personal notebook and get 5% instant discount when you pay with HDFC Credit or Debit card. Apply the given voucher code at the time of final payment. Offer is valid for a limited time. Purchase online and get 5% off on online payment made through HDFC Bank. Offer is valid on minimum purchase of Rs.1000. Maximum discount of Rs.1000 can be availed. Grab the coupon code to save the money. Offer is valid for a single purchased. This offer is valid for Indian residents and citizens only. Shop online now and pre-book a Google Pixel 2 or Pixel 2 XL and get benefits worth Rs.35,000. Get 1 year of unlimited voice and data (750GB) worth Rs.9,999. Also get cashback of Rs.8,000 on HDFC Credit Card. Hurry to avail this offer before it ends. eBay is giving you Diwali Bonus Sale. Get 10% instant cashback when you shop via HDFC Bank Credit Cards. Use the given coupon code at the time of checkout. Offer is valid till 17-10-2017. Enjoy 30% discount on Swiggy Restaurant Orders, when payment is made through HDFC Debit Card, HDFC Credit Card or online banking. Apply coupon or promo code at the time of payment and save money. The amount of discount may vary from order to order. Enjoy the offer before it ends and save money. Book best quality home furniture online and avail 5% cashback on your orders. Maximum cashback per month per customer is Rs.1500 cashback points. Offer is applicable on transactions done by HDFC Bank Debit Cards. Apply the coupon code before it ends. Avail flat 23% discount on all hotels. Also get 5x rewards with HDFC Bank credit and 5% cashback with debit cards. Use the given coupon code to redeem this offer. Maximum discount that can be availed is Rs. 25,000 per booking. Don't miss out! Enjoy Upto Rs.10,000 Off + extra 10 cachback with HDFC bank cards. Offer Includes Brands such as Apple, Samsung, Motorola, Lenovo, Micromax, Oneplus, Redmi & Many More. Also get additional 10% cashback. Apart from that customers avail Upto Rs.11,000 by exchanging old smartphones. Don't miss out this deal. Book the international flight online and get up to Rs.8000 discount. Enter the given coupon code at the time of checkout. Offer is valid for HDFC Bank Credit and Debit cardholders. The offer is valid on bookings made between 1500 hrs to 2159 hrs on every Tuesday. 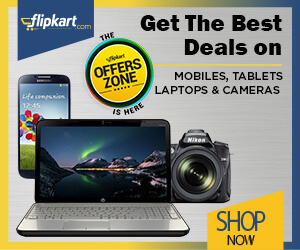 Flipkart is giving you The Biggest Offer ever. Enjoy 10% instant discount on online shopping. Minimum transaction amount should be Rs.40,000. You may a discount of Rs.2500 per card. Offer is applicable once during the offer period. Avail no cost EMI this festive season with HDFC bank credit and debit cards. Use your HDFC Bank Credit/Debit Card for your bookings at RedBus and get a cashback of 5%. Minimum booking amount should be Rs.1000. No coupon code is required to redeem this offer. Swiggy is giving you 20% discount when you pay through HDFC Bank Cards. Use the given promo code during check out. Minimum order of Rs.300 is required to avail this offer. Maximum discount of Rs.100 can be availed. Enjoy the deal. Spend minimum Rs.2499 or more and get Rs.500 off on shopping. Enter the given promo code at final payment. The offer can be availed only once during the offer period. Offer is valid for HDFC Bank users. Please visit the offer page for more details. Shop and get 80% discount on salwar suits range. Semi stitched suits, stitched suits and dress material available here. No coupon code required. On paying from HDFC bank credit card get 10% discount more and from debit card 5% instant cashback. Avail the offer! Book online for and get 20% off on each weekend ride booked up to a maximum of Rs.75 per ride. Enter the given coupon code at the time of checkout. Offer is valid for HDFC Bank Credit Card and Debit Cards. Enjoy 15% instant cashback when you pay through HDFC Bank Credit or Debit Cards. Offer is valid on selected Lifestyle, Beauty & Personal Care Categories. Minimum cart value of Rs.1000 is required. Offer is only applicable on all HDFC Credit or Debit Cards. Pay with HDFC Debit or Credit cards and enjoy up to Rs.3000 discount on selected products. Enter the given coupon code at checkout page. Limited period offer. Enjoy an additional 5% cashback when you pay with HDFC Bank debit cards and enjoy the deal. Minimum transaction of Rs.2000 is required to avail this offer. Cashback would be credited by HDFC Bank. Avail no extra cost EMI ON international flights on MakeMyTrip. Offer is valid for HDFC Bank Credit Cards. No coupon code is required to avail this offer. Don't miss this offer. Get 25% discount on purchase of movie tickets with your HDFC Times card. Get INR 50 off on purchase of F&B once a month. Go through the regular ticketing flow for selecting the movie, cinema and show of your choice. Proceed to payments page and confirm your details by providing your email id & mobile number as this information will be used for confirming your transaction. Click on 'Select Offer' and choose 'HDFC Bank Times Card Offer’ from the offers drop down list. Visit offer page for more details and enroll today. Shop and get flat 25% off on furniture brand "Casacraft'. Offer is valid on HDFC Card users. The offer is applicable only on the orders above Rs.1000. Apply the coupon code at final payment to claim the discount. Offer is valid only for genuine customers. Flipkart is giving a special offer to HDFC Bank users. Get 10% instant discount with HDFC Bank Credit & Debit cards on the purchase of select TV, Refrigerator, Air Conditioners, Washing Machines, Fans, Water Purifiers, Inverters, and much more. Minimum cart value of Rs.5,999 is required. You can avail up to a maximum discount of Rs.1500 per card. Offer will not be applicable on Mi and Thomson TVs. Pay via HDFC Credit Card or Debit Card and enjoy 5X rewards on credit cards & 5% cashback on HDFC debit cards. Use the given coupon code at final payment. Once the promo code is applied, complete the transaction with your HDFC Credit/Debit Card. HDFC Bank Offer - Flat 25% on Furniture Brand "Casacraft"
Shop online for furniture and get flat 25% off on furniture Brand "Casacraft". Use the given coupon code at the time of checkout. Offer is applicable on HDFC card users. Offer is valid till 31-3-2018. Shop online and get 5% cashback when you transact minimum Rs.10,000 or more. Offer is valid on HDFC Bank Debit Card & Credit Card. Offer is valid on each Friday during the offer period. Hurry to avail this offer before it ends. Makemytrip is giving a cashback of Rs.8000 on every International flight booking done using HDFC credit card. Offer applies on bookings made on Thursdays only. Minimum booking amount to avail the cashback is Rs.25000. You have to apply the given coupon code at the time of booking. Customer will not be eligible for cashback if there will be cancellation of the booking. Avail 5% cashback on flight & hotel booking on payment via HDFC Bank Debit Card. To avail this offer, the user must enter the given voucher code before making payment. Offer is valid on Every Thursday, Friday, Saturday & Sunday. Book and avail flat 20% discount on Zoomcar. No minimum booking value is required. The maximum discount you can get is Rs.1000. Offer is valid payment through HDFC Credit or Debit Cards. Offer is applicable on Monday to Friday booking. Offer is valid for all users. Pay via HDFC Credit & Debit Cards and get 10% cashback on minimum transaction of Rs.2499. You may get maximum cashback of Rs.500. Offer is valid on every Monday during the offer period. Offer is applicable on both Jabong App and Website. Enjoy 10% off on your hotel booking at Travelguru. Offer applicable only if you make the payment through HDFC Bank Credit Card. Apply the coupon code at checkout to avail this offer. Order online and get flat Rs.200 off on purchases above Rs.2000. Coupon code will be valid only once during the promotion period per customer. Use the given coupon code at final payment. Offer is valid between 1st to 7th of every month. Offer is valid for HDFC Bank Debit & Credit Card users. Avail free delivery on all orders from your favorite restaurants every weekday this week. Pay via HDFC Diners Cards to earn 10x reward points. No coupon code required. Offer is valid on select eateries. Now get 15% instant discount on a minimum order of Rs.1500. Coupon code is also available. Maximum discount is Rs.300 per Card. Offer is valid once per user/ card during the offer period. Put an end to your store hopping with remarkable laptop shopping. Pay via HDFC Credit & debit card and get a discount of up to Rs.3000. Enter the given coupon code at the time of checkout. Offer is valid for a limited period. MakeMyTrip offers you HDFC Bank users. Get up to Rs.10,000 cashback on international flights. Minimum booking amount of Rs.10,000 is required. Enter the given coupon code at final payment. Coupon code is valid every Thursday during the offer period. Get Rs.399 off when you spend minimum Rs.1299 or more and save the money. Coupon code is also available. Offer can be availed only on making full payment using HDFC MasterCard Debit Card. Offer is valid only for online purchase via the website. Book online now and get flat 20% off on domestic hotels when you spend minimum Rs.2000 or more. You may get a maximum discount of Rs.3000. Coupon code is also available. Offer is applicable for HDFC Bank Users. Visit the store and get 5% cashback on all food orders during weekdays on purchases above Rs.500. No promo code is required. Offer is valid for payments made through HDFC Debit Cards. Maximum cashback per month per customer is Rs.100 cashback points. Don't miss this offer. Ajio gives an exclusive offer on various brands such as Ajio, Antiferro, Amori, Anicca, and many more and gets minimum 50% off on fashion accessories, clothing, and footwear. Stay tunes to get the latest deal for big savings for big savings at Ajio.com. Don't miss this deal. Order now and get flat 25% off on gift products. Use the given coupon code at the time of checkout. Offer is valid till 31-1-2017. Use your HDFC Bank Credit Card to book domestic flight tickets on Spicejet and avail a discount of Rs.1000. Offer is not applicable on payments through Pay Pal, Netbanking or any other credit/debit card. Offer applicable only if you apply the coupon code at the time of booking. Also get free priority check-in with your booking. Get flat 30% discount on order when payment is made through HDFC. This offer is available for HDFC Master Card users only. Coupon code is also available. Get other exciting offers also. Book now and enjoy up to Rs.1500 instant discount on domestic flights. Offer is valid for every Friday only for HDFC Bank Credit Cardholders. Apply the given coupon code at final payment. Offer is valid for limited period. Get 10% instant discount with HDFC Bank Credit & Debit Cards on the purchase of select Samsung products. Minimum cart value is Rs.5,999. Offer is applicable only on select Samsung Products (Mobiles, Accessories, TV & Appliances. Don't miss the chance to save the money. Use your HDFC Bank Credit Card to book domestic flight tickets on Yatra and avail a discount of up to Rs.1100. Offer is not applicable on payments through Pay Pal, Netbanking or any other credit/debit card. Offer applicable only if you apply the coupon code at the time of booking. Book now!!! SpiceJet gives you another reason to look forward to weekends. Get 50% off on SpiceMax with HDFC Bank Credit Cards. Apply the promo code at final payment. Maximum discount is Rs. per SpiceMax Seat. The offer is valid both for new and existing flight bookings. Avail a discount of up to 60% across the site. Apply the given coupon code during checkout. Coupon code is not applicable on Gift Card sales. This promotion is valid only for genuine customers. Coupon code is available for HDFC Credit Card holders. Enjoy up to 20% off on order of flowers, cakes, and gifts when payment is made through HDFC Times Card (Platinum or Titanium Card). This is an online offer. To grab this deal no coupon code is needed at the time of final payment. This deal cannot be combined or clubbed with any other offer. Get the offer before it expires and save money. Croma is giving an exclusive offer to HDFC bank card users. Get 5% cashback when you transact minimum Rs.10,000 with the card. Offer is valid till 31-3-2018. Its time to get ready for biggest sale of the year. Choose over 25000+ products from the landing page and avail upto 80% discount + 10% +HDFC Cashback + 10% Pay Balance CB. This deal is valid on all categories listed on website includes mobile phone, tablets, camera, fashion clothing, home appliances, baby items, watches, footwear and acessories items. Maximum discount of Rs.1500 can be availed against each card.. Cashback amount will be added to users account by 24th March, 2018. Hurry grab the deal before it over. Shop online now and get 5% cashback on HDFC Debit and Credit Cards when you transact minimum Rs.1500. You may get maximum of Rs.500. Use the given coupon code at the time of checkout. Offer is valid till 15-1-2018. Don't this offer. Shop now and get Rs.200 off on a min. transaction of Rs.1000. Offer is applicable on HDFC Debit and Credit Cards. Offer is valid till 31-12-2017. Enter the given coupon code at final payment. Offer is valid on first order only. Shop on Jabong using HDFC Bank Credit Card & Debit Card and get 10% Cashback on minimum transaction of Rs.2499. You can earn a maximum cashback of Rs.500. Offer is valid only on transactions made using HDFC Bank Credit Card & Debit Card. Offer is valid on Every Monday during the offer period. Buy electronics online and get 10% instant discount. The minimum purchase should be Rs.5000. Maximum discount of Rs.2000 can be availed. Offer is valid on HDFC Bank Credit or Debit cards online. Offer is valid is only once per card. Use your HDFC Bank Credit Card to book international flight tickets on Goibibo and get a cashback of up to Rs.5000. To avail this offer apply the coupon code at the time of booking. Book now to save your money. SpiceJet gives you another reason to look forward to weekends. Avail up to Rs.500 discount on SpiceMax with HDFC bank credit & debit card. Apply the promo code at final payment. The offer is valid for both new and existing flight bookings. The Offer is valid on weekends (Friday, Saturday and Sunday). Headquartered in Mumbai this private sector leading Indian bank was founded in 1994. Being the first generation bank that merges with another bank like Times bank in 2000, this bank has its presence in countries like Bahrain, Hong Kong, and Dubai. The largest bank in Market capitalization offers its customers with services like Credit cards, consumer banking, corporate banking, finance and insurance, investment banking, mortgage loans, private banking, private equity, wealth management. Further, having it tie-ups to a number of the store this bank bring its users with flooded benefits while making use of its credit and debit cards and let them save on their every purchase. HDFC do offer its customers with a different selection of cards such as e Diners Club Black, Titanium Times Card, Jet Privilege HDFC Bank World and the Platinum Times Card, each card offers different benefits that are hard to resist. Having a network of 4,727 branches this private sector bank even proves to be best when you are most in need of it. As it offers you with auto loans, two wheeler loans, personal loans, loan against property retail banking and other services that are beneficial in every situation. Amazon - This online store brings its customers with 10% Cash Back on HDFC Bank Debit or Credit Cards and additional 10X Reward Points on Credit Cards. The offer is valid only for purchases above Rs.3, 999. The maximum cash back permitted/allowed per Card (including all add-on-cards) during the Offer Period is Rs. 2,000/-. The best thing is if the same customer is holding two different Amazon cards than he will beneficially get offers on both the cards. Flipkart- The admired store that let you chooses best products on an exclusive HDFC offers. Flipkart offers cash back offers on electronics, mobiles, clothing, laptops, Washing Machines, Air Conditioners, Home appliances and many more categories. Another cash back offer it offered are awesome cash back offer worth 10% discount coupon code with HDFC Bank Discount for Credit / Debit / Net Banking customers. Discounts are what that are admired by all of us and we did never miss a chance to grab the best offers and money saving options. Having its tie-up with a number of lifestyles, fashion and other stores HDFC offers its customers with special offers and benefits that are hard to resist. Whether these discounts are offered on your eatables or grocery stores you will take higher benefits on all of them. Apart from downloading mobile apps will bring you with various alluring benefits and keeps on notifying you of the money saving offers. Now you are no more left with the days when you have to collect cash from your nearest ATMs. Other than online shopping, offline shopping also brings you with swipe options where you can enjoy your benefit and comfortable shopping while swiping your card and make easy and secure payments within a second.